Those of you who have been following The Frustrated Gardener for a while will recall that I wrote about Goodnestone Park shortly after starting out on my blogging adventure. Down here in East Kent there’s a shortage of good gardens to visit, so when we feel the need to get out, it’s often here that we come. The gardens are only open on Sundays throughout March, but the weather last weekend was even too perishing for the valiant ladies serving teas in the stables. They battoned down the hatches and retreated shortly after we arrived, leaving us alone to enjoy the grounds. I like to imagine they returned home to one of the Dutch-gabled, red brick cottages that line the street leading up to “The Big House”. 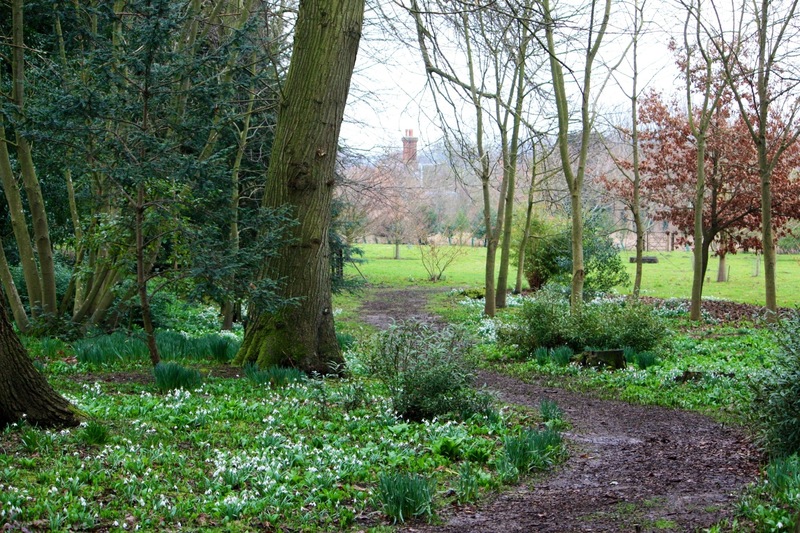 Goodnestone is a garden of two halves; the first a series of glorious walled gardens, the second an informal woodland packed with mature oaks, underplanted with a collection of camellias, rhododendrons, Cornus kousa and sweetly-scented Daphne. 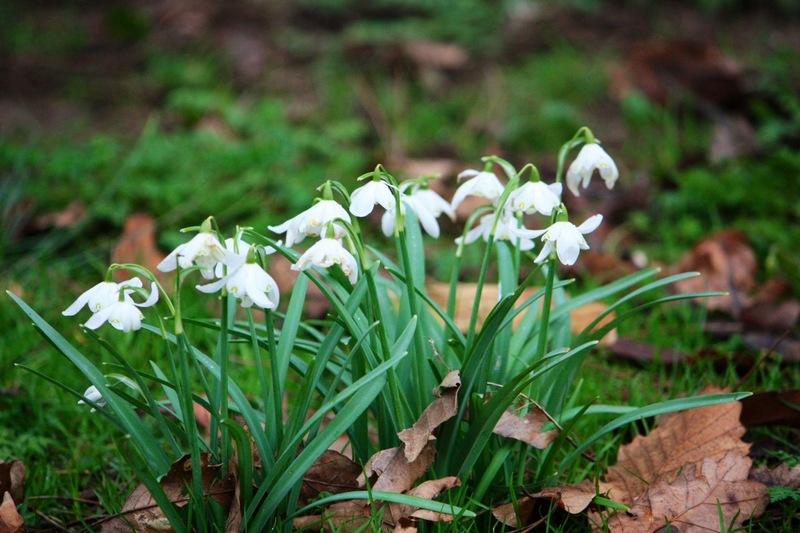 It’s the woodland that takes centre-stage early in the year, when the ground is carpetted with snowdrops and aconites and the dark-leaved shrubberies are studded with perfect pink and white blossoms. My Cornish ancestry means I am particularly partial to a nice camellia, but I do prefer the simpler, single-flowered ones. I love the contrast between the deep green leaves, the pure white petals and the bright yellow centres of these elegant flowers. 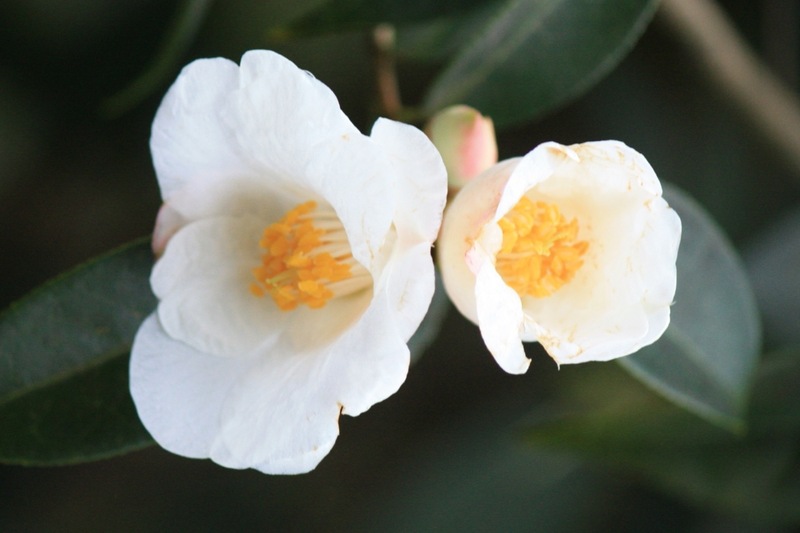 Sometimes in bloom as early as October, the Christmas camellia, Camellia sasanqua, a native of southern Japan and was traditionally a source of oil, pressed from its large seeds. This was used for lighting, cooking and making tea. Sasanquas are also known for their delicate tea-like fragrance. A good white flowered variety is ‘Narumigata’. At this time of year it’s often the least significant flowers that create the most incredible scent. With the wind chill at about -6 degrees and snow in the air it was a miracle that there was any trace of fragrant Daphne or Sarcococca (sweet box), but somehow they managed to prevail. 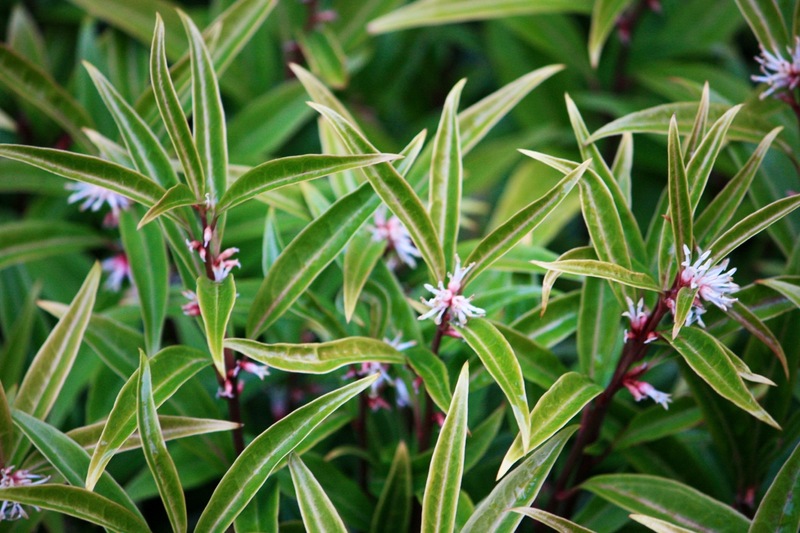 During the winter months, Sarcococca hookeriana var. dioyna ‘Purple Stem’ (below), is especially striking with its pale-edged leaves and purple-flushed flowers. 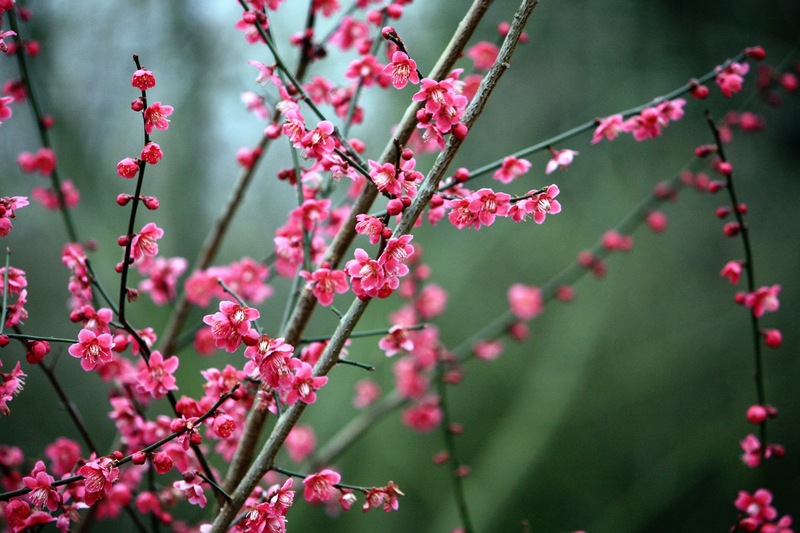 On the fringes of the grass garden, a grove of ornamental flowering plum trees sparkled, their bright pink flowers dazzling against the leafless grey of the woods behind . I hope one day to go to Japan to see the legendary cherry blossom, but these trees show that the same magic can be achieved closer to home. See more in this gallery. We missed the special snowdrop and hellebore extravaganza on February 24th, but not the flowers themselves, still in their prime and nodding shyly in the cold wind. 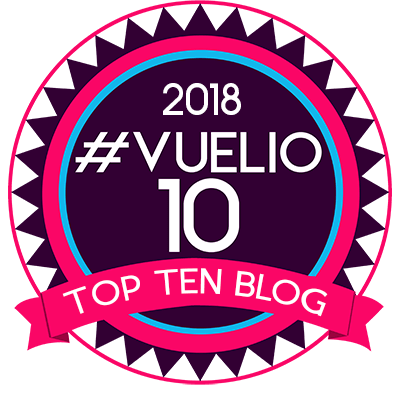 Both flowers enjoy a serious following in the UK and are highly variable, hence the vast number of varieties and hybrids available to gardeners. 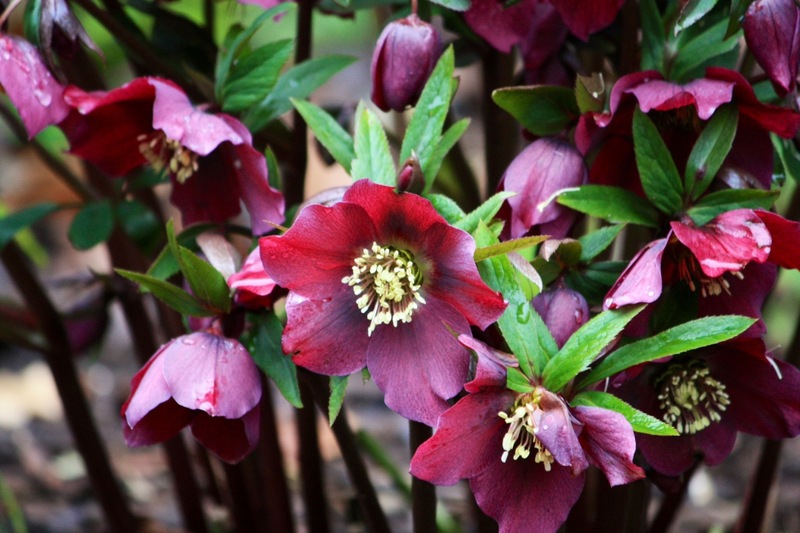 My favorites are the plum and almost black Helleborus orientalis hybrids, like the ones below. 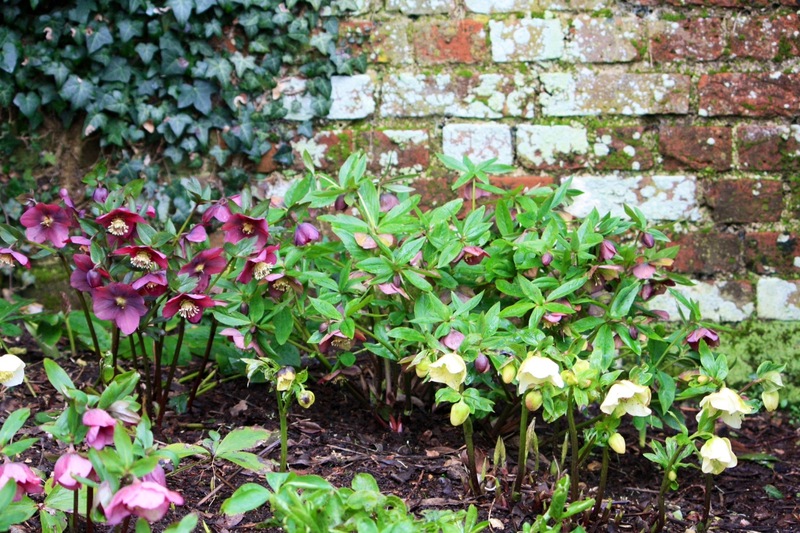 Once established, hellebores produce copious flowers and provide a lovely backdrop to dwarf narcissi and irises. They are also pretty planted at the foot of an ivy-covered wall. Stupidly gloveless and with frostbite and trench foot beginning to set in, we retreated to the comfort of the car, heated seats on full blast. With the coldwave continuing, it looks like flowers will be in unusually short supply at Easter. What flowers are you willing to bloom this month? My spirit is willing, the calendar is hopeful, but Mother Nature is still in charge. We had snow two nights ago and we have a huge storm coming our way mid week with a forecast of more than a foot. So, I’m loving your photos of things to come. We’ve yet more snow forecast for tomorrow, but it’s too late, the plants have decided to press ahead regardless. Stay warm! Yes, sadly addicted, but as vices go it’s not a bad one! Looking forward to keeping up with all your travels and new discoveries. Off to Bhutan next week so hoping to make a few discoveries of my own. I am really looking forward to see pictures from Bhutan! Look forward to see your photos from Bhutan too. Thanks Hang. Not long to go now! When Is Too Late to Plant Spring Bulbs?